Strange how my trousers had shrunk. And in an act of cowardly collaboration, my bathroom scales (in league with that dastardly mirror), had started to lie. The holes in my belt had waited until night-fall to edge outwards. Even my bathroom towel seemed smaller. There was conspiracy afoot! Which was when I remembered T.S. Eliot’s words: “Human kind cannot bear very much reality.” And the reality was that despite quick walks, my metabolism was slowing down. Or however those in denial of weight-gain explain a thickening waist. So a year ago, I joined a gym. It’s my sort of place with a dedicated boxing area, state-of-the-art cardio and weight equipment, interesting classes and friendly members. After an absence of eight years, those first steps in the gym shocked me: I’d lost all my stamina! My range of movement had tanked! 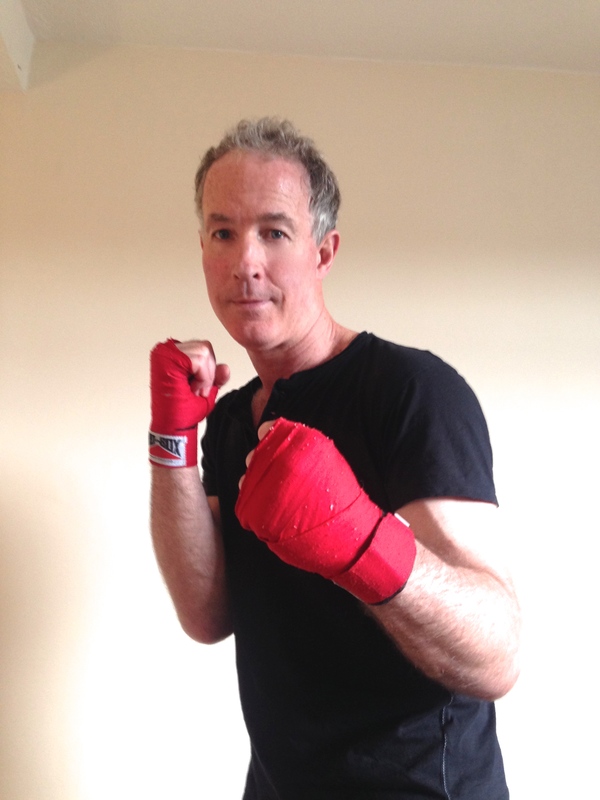 As for my boxing technique—I’d forgotten the difference between a left hook and a fish hook. Depressingly, for six weeks the scales in the men’s changing room refused to register any improvement which meant one thing: The conspirators back home had gained an ally. My routine was simple. Three or four visits a week. Start with stretching and warm up. Jump some rope, shadow box, then five three-minute rounds on the punch bags. Cardio machines (what sadist invented the StairMaster?) followed by dumbbells. Then stretching and deep breath, in readiness for another confrontation with the dreaded scales that not only indicated my weight, but also informed me of my Body Mass Index (BMI). Too much information. I’ve learned to listen to my body. If something is hurting, I stop. I stretch. I always build slowly to greater effort and monitor my heart rate. That way I’ve kept injuries to a minimum. After a hesitant start, I’m up to fifteen rounds on the bags, a hundred floors climbed (think Empire State Building), two thousand dumbbell lifts and hundreds of calories burned each visit. Soon my trousers threw in the towel and started growing again. What made me keep going? I didn’t look too far ahead. I set myself realistic goals and congratulated myself on reaching them. A pound or two lost each month on the scales or added to the dumbbells was achievable. Everything else was a bonus and soon they began to flow: I’ve got my energy and flexibility back! My resting pulse is under sixty. My BMI is comfortably in the green band and I don’t need to buy a new wardrobe. I added a healthy diet too and am pleased I’ve (mostly) stuck to it. I really do feel twenty years younger and recommend using a gym to anyone who wants to shed the pounds or just improve their sense of wellbeing. Because wellbeing matters.